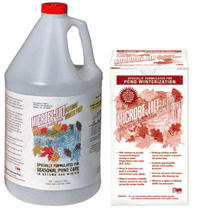 Microbe lift helps to accelerate the decomposition of leaves, scum, sediment and other organic matter in the fall and winter. For larger ponds. Two part system; 1 gallon of liquid bacteria and eight 2 ounce water soluble packets of dry enzymes. 1001-5000 gallons: 7oz 1st month, 8oz 2nd month, 9oz 3rd month, 10oz fourth month. 5001-10,000 gallons: 15oz 1st month, 15oz 2nd month, 15oz 3rd month, 15oz fourth month. 10,001-15,000 gallons: 20oz 1st month, 20oz 2nd month, 20oz 3rd month, 20oz fourth month. DURING THE SECOND MONTH, ADD TWO PACKETS OF DRY ENZYMES IN ADDITION TO THE LIQUID BACTERIA.